THERE IS SOMETHING about Brescia Calcio. Founded in 1911 in the quaint but industrial city that is situated in the Lombardy region of Italy, they are oft described as a yo-yo team, yet hold the record for spending more seasons in Serie B than any other. If one looks through their pretty unremarkable history, you will find that some pretty remarkable players have won the Biancoazzurro jersey. The most famous one of course is Roberto Baggio, who brought such unprecedented levels of attention by his mere presence during his four-year stint. The bearded genius, Andrea Pirlo, was born in the city, raised through the Primavera set-up, and made his Serie A debut at the age of 16 in May 1995. Pep Guardiola enjoyed a brief post-Barcelona stint at the Stadio Mario Rigamonti in 2001/02 in a team that featured not only Il Divin Codino but also future World Cup winner Luca Toni. That’s quite an alumnus. The most remarkable example, however, has to be that of one Gheorghe Hagi, the Maradona of the Carpathians. 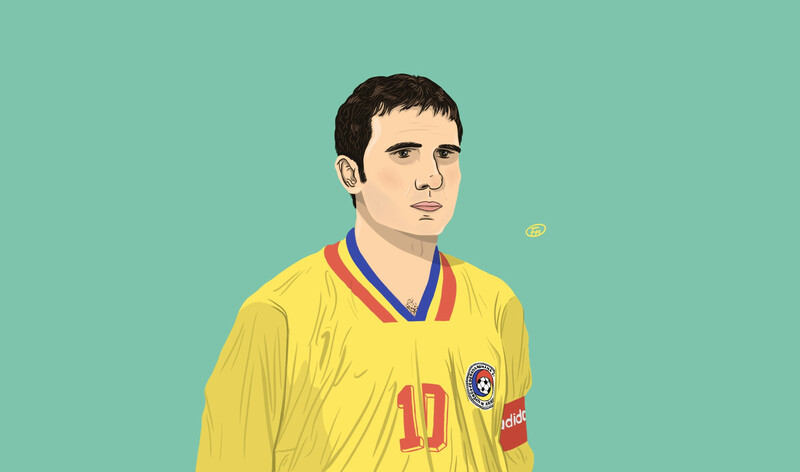 Romania’s greatest player adorned the jersey of the Little Swallows for two seasons, sandwiched between spells at Spanish behemoths Real Madrid and Barcelona. When viewing his career profile, it makes for a curious sight. Real Madrid. Brescia. Barcelona. The mind-boggling aspect of Hagi’s stint in Italy was that, at 27, he was supposed to be at the pinnacle of his career when he moved in the summer of 1992. When Baggio traversed the same path eight years later, he was 33 and in search of first-team football with a view to making the Italy squad for the 2002 World Cup. Guardiola was in need of a home after being ruthlessly shunted out of Catalonia by his beloved Barcelona at the age of 31. Luca Toni was only 23 when he led the line and wasn’t the predator he developed into in later years. This is what makes the Hagi case fascinating. How did he end up in the northern city? In February 1987, Hagi was transferred to Steaua Bucharest – or borrowed one can say – for the European Super Cup match against Dynamo Kyiv. Steaua, who were the reigning European Cup champions, had political suction in the form of Nicolae Ceaușescu. Ceaușescu, of course, was the leader of the Romanian Communist Party and his son Valentin oversaw the running of the club, personally intervening in teams matters to ensure the nation’s biggest team was well equipped to reflect positively on the country, especially in European matches. Hagi was supposed to play the one-off game against the Ukrainians. One match turned into three years, despite the opposition of his former club Sportul Bucharest. Hagi never played for them again. Overtures were made by foreign sides to take Hagi away from Romania during the late 1980s but were rejected by the Romanian government. Giovanni Agnelli, impressed with what he saw from the diminutive number 10, offered to build a Fiat factory in Bucharest at his expense in exchange for Hagi. Next up was Silvio Berlusconi who, in 1989, approached an escaped refugee called Giovanni Becali, now Romania’s biggest football agent, with the job of coaxing Hagi into leaving his home country for Italy. Despite being offered a huge sum of money, Hagi wouldn’t leave without his family so the deal collapsed. With the fall of the Communist Party in the wake of the Romanian Revolution in December 1989 and a return to democracy, Romanian players for the first time had the freedom of movement denied to them for so long. In May 1990, weeks before he was due to travel to Italy for the World Cup, Real Madrid broke their transfer record to sign him, shelling out 400 million pesetas. Players of Hagi’s talent today would leave Romania in their early-20s; Hagi was 25 when he finally left. Hagi’s two-year stint in the Spanish capital was mixed. Los Blancos had won the last five LaLiga titles but the era of La Quinta del Buitre, which had dominated the Spanish football landscape in the latter half of the 1980s, was coming to an end. The signing of Hagi was intended to signal in a new era. A fresh era was starting, however it wasn’t at the Santiago Bernabéu. It was at the Camp Nou. In the same summer of 1990, Barcelona, not to be outdone by their rivals, also signed a left-footed temperamental maverick from Eastern Europe in the form of Hristo Stoichkov from CSKA Sofia. Former Barcelona manager Helenio Herrera felt that his old side’s rival got the better player. Whether they did or not is open to debate, but what is certain is that the Bulgarian made an immediate impact for Johan Cruyff’s Barça, as the Dream Team began to take shape, and would win four consecutive titles and the European Cup for the first time in 1992. Hagi would win nothing with Los Merengues, with the club going through a transitional phase that resulted in the chewing and spitting out of managers at an alarming rate, even by Real Madrid standards. John Toshack, Alfredo Di Stéfano and Radomir Antić all came and went in his first season. Despite the chaos, they managed to finish a commendable third. It speaks volumes about the appeal of Serie A in the early-90s that Brescia even attempted to sign a player like Hagi; the mere idea is completely outlandish when reflected on some 23 years later. In the modern game it would be similar to seeing Bournemouth sign Isco or Mesut Özil. Yet every team in Serie A had a superstar player in the 1990s. It was the greatest league the sport of football has ever seen. What ultimately swung the deal in Brescia’s favour was their coach, Mircea Lucescu, the now legendary Romanian manager who was just starting his managerial career. 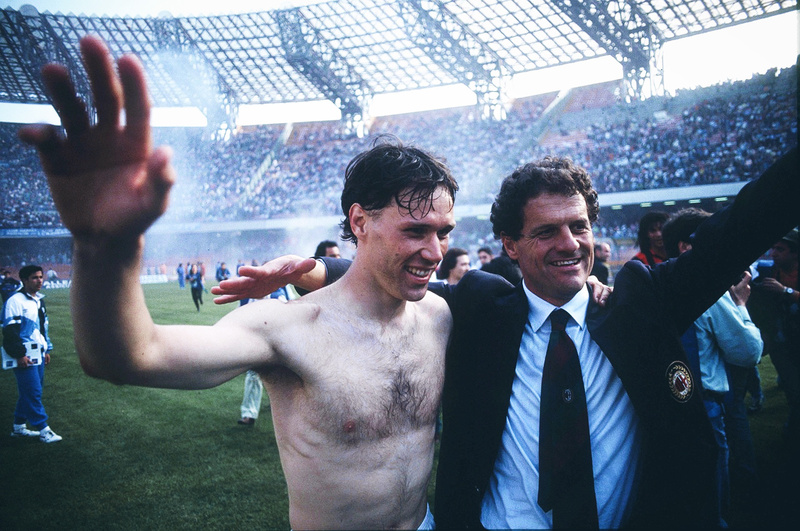 He had taken over at Brescia in the summer of 1991 after a year with Pisa. He won promotion in his first attempt as Brescia topped Serie B, and for the upcoming season in Serie A he wanted to create a ‘Little Romania’. First Florin Răducioiu, later of West Ham fame, was signed from Hellas Verona. That was followed up with the signing of Ioan Sabău, a fellow Romanian midfielder, from Feyenoord. New Brescia president Luigi Corioni, who had replaced Claudio Cremonesi only six months prior, set his sights on Hagi but knew it wasn’t going to be easy. In early July, Corioni flew to Madrid and a deal was quickly agreed upon for eight billion lira – around £2 million – but a deal was yet to be struck with the midfielder as he was back in Romania on holiday. Hagi’s agent, Becali, declared: “I believe there is a 0.01 percent possibility of Hagi playing in Brescia.” Hagi demanded the same wages he was earning at the Bernabéu. Two weeks later he was presented as a Brescia player. Lucescu’s ‘Little Romania’ within the Biancoazzurro was complete. Hagi’s first season in Italy, much like in Spain, wasn’t entirely successful but was tinged with moments of genius and madness. He got sent off on his league debut and the team struggled to score goals, recording only 36 – the lowest in the league. Hagi himself only netted five. By the end of the season, Brescia was forced into a relegation playoff against Udinese, with both sides having finished on 30 points. A week after the season officially ended, Brescia and Udinese squared off in Bologna’s Stadio Dall’Ara. Hagi’s side capitulated 3-1. The club was back in Serie B after only a season. Raducioiu, who scored 13 goals, didn’t hang around and was sold to Milan. Hagi, however, against all plausible explanation, decided to stay with Brescia, to show “he wasn’t a coward”. Serie B had the privilege of having two bona fide world-class stars amongst its ranks for the 1993/94 season in Hagi and Gabriel Batistuta who, like Hagi, decided to stay with Fiorentina despite relegation. 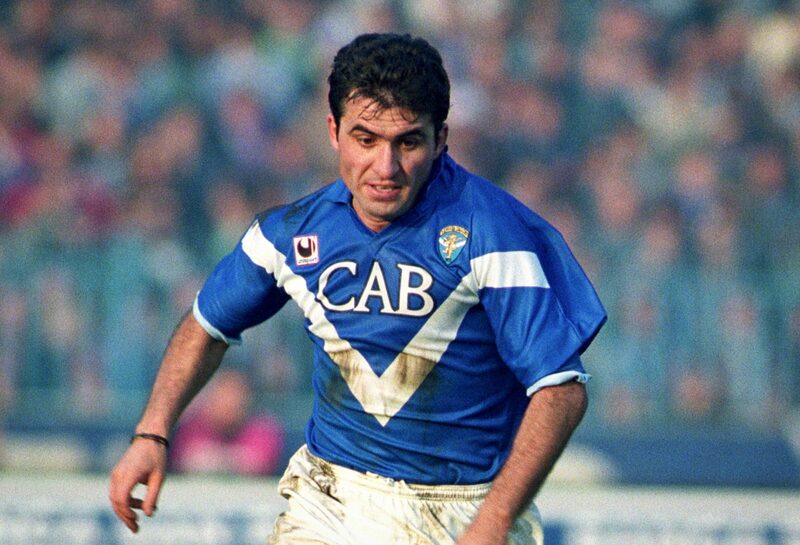 With the World Cup less than a year away, Hagi began to hit top form for Brescia. Much like the way he improved upon his first year at Real, he catapulted the Lombardians towards the top of the table, scoring sublime goals against Pisa, Venezia and Fiorentina. Yet the season wasn’t without its controversy. Lucescu gave Hagi permission to join up with the Romanian national team for a pre-World Cup friendly even though he was suspended from playing after spitting on Northern Irish striker Phillip Gray in the previous friendly. Hagi arrived back to Italy a day late and Lucescu promptly dropped him from the starting line-up. It was the first time he was voluntarily taken out of the Brescia team since signing. Lucescu’s words would prove to be prophetic; Brescia finished third and secured promotion back to the top flight, with Hagi scoring nine goals. Brescia also had a date at Wembley, beating Notts Country 1–0 to win the much-maligned Anglo-Italian Cup. It was his first piece of silverware in four years. Hagi would go on to play an instrumental role in leading Romania’s golden generation to the quarter-finals of USA 94, narrowly losing out to Sweden on penalties. He had played to the level that Lucescu, who was as much Hagi’s father figure as he was his biggest critic, knew he was capable of. His left foot weaved utter carnage over the five games he played. Who can forget that goal against Colombia or the assist to Dumitrescu against a Diego Maradona-less Argentina? He was undoubtedly one of the best players at the tournament, even if his own assertion that he was the best player at the tournament was incorrect. He did, however, belong in the bracket with Romário, Stoichkov and Baggio. With Hagi’s performances fresh in the memory, it was only a matter of time before a shot at another big club arrived. Johan Cruyff persuaded Barcelona to shell out £2m for the 29-year-old, who could’ve formed a potentially mouthwatering alliance alongside World Cup co-stars Romário and Stoichkov. It didn’t turn out that way – like countless other periods in the mercurial superstar’s career – to the dismay of fans around the world. Hagi’s period in northern Italy is often forgotten about when discussing his career. It was an unusual move, yet he maintains he enjoyed his stint with Brescia. One thing is certain: not many fans of provincial clubs can boast getting to witness talents like Hagi, Baggio, Pirlo and Guardiola wearing their club colours. To their joy, the fans of Brescia can.